The trail-blazing women’s curling team of South Korea is making Olympic history at PyeongChang, as it prepares for the medal match after securing a string of surprise victories over the world’s top teams in the winter strategy sport. And the team’s fast-growing fan base in Korea can’t seem to get enough of the four Olympic curlers from the small town of Uiseong, North Gyeongsang Province. 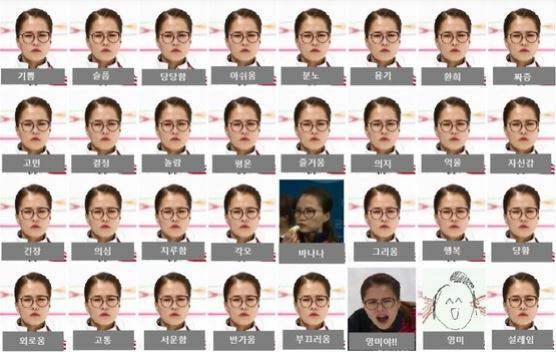 From curling-imitation parodies featuring vacuum robots and broomsticks to memes commemorating the team’s stern-faced skip Kim Eun-jung and her signature catchphrase “Yeong-mi-yah!” a curling sensation is pulling at the heartstrings of Korean fans. At PyeongChang, South Korea’s female curling team has risen to fresh international stardom. Ranked eighth in global rankings, the host country has secured victories over some of the world’s top contenders in the sport including Canada, Switzerland, Great Britain and Sweden. South Korea has already qualified for the women’s team curling semifinals as of Tuesday. With seven wins and just one loss so far, Korea is currently ranked first in the round robin tournament applied to curling. On Wednesday, the team clinched its seventh win by defeating the Olympic Athletes from Russia 11-2. The team will wrap up the round robin session by competing against Denmark at 8:05 p.m., Wednesday. This is a drastic improvement from 2011, when the 2018 Winter Games were awarded to PyeongChang. At the time, South Korea’s world ranking of women’s curling had been too low to even qualify for the Olympics. The Korean team is now taking aim at bringing home the first-ever medal in curling, possibly a gold. With growing anticipation, local interest in the four-member curling team shows no sign of abating. 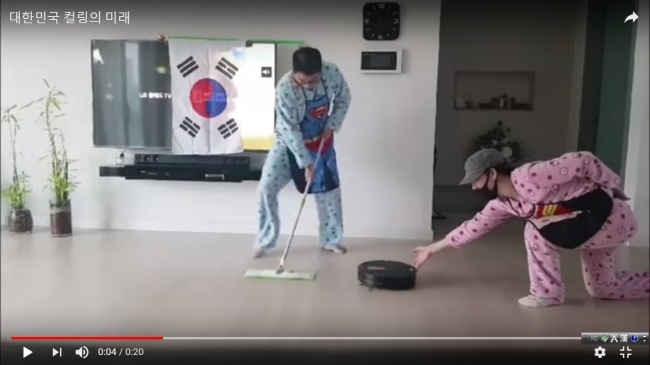 South Korean citizens have set out to simulate the curling competition in the own houses by using household cleaning tools such as a self-driving robot vacuum cleaner, mops and broomsticks. Several YouTube videos showing friends and families, who are “curling” with the vacuum as the stone and floor mops as the curling brooms, have been circulating on social media including Facebook and Instagram. While laughing, they shout out “Hur, hur!” -- the word, short for "hurry," that is used by the Korean skip to tell the sweeper to sweep harder during a curling match -- to imitate the star players. From high school classrooms to company hallways and living rooms, the fun parodies on curling are continuing to turn up on popular content-sharing websites and online communities. 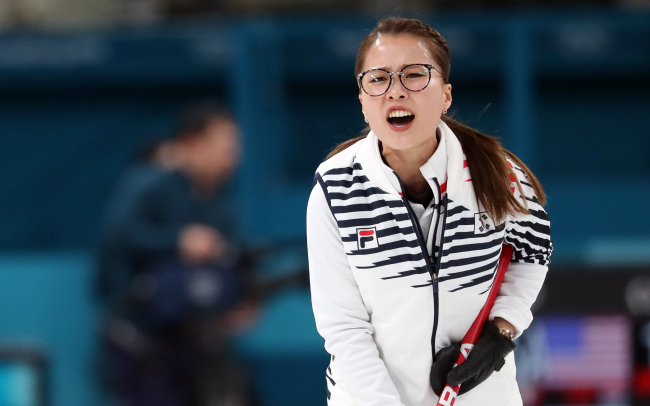 Without a doubt, the South Korean female curling team’s biggest star has been Kim Eun-jung, the group’s skip, the team’s captain and main strategist. She has become famous for her stern, charismatic expression, which appears to stay unchanged at all times during the competition. 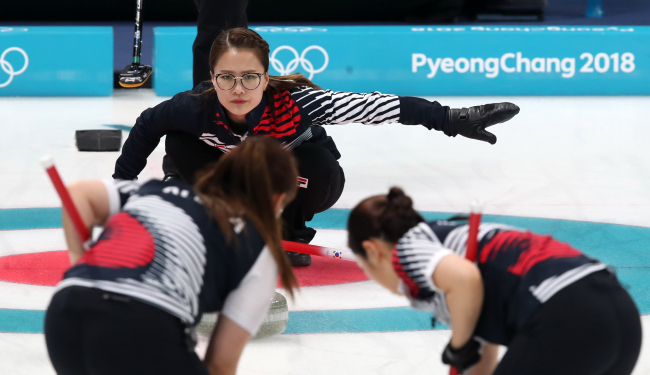 Kim’s stern face combined with her thick glasses has become her trademark look, winning her a new nickname as the human “robot” in curling. The memorable traits have even led online fans to create memes of Kim making the same face when happy, sad, surprised, angry or bored. Even when eating a banana, Kim’s expression remains unchanged. Her expression only changes when she is shouting “Yeong-mi-yah!” the Korean phrase for calling out the name of her teammate Kim Yeong-mi, the lead in the team, to ask for a harder or softer sweeping action. The phrase, heard at every match played by the team, has become a catchphrase which Korean fans claim is the “magic word” that helps the team play so well and claim continued victories. 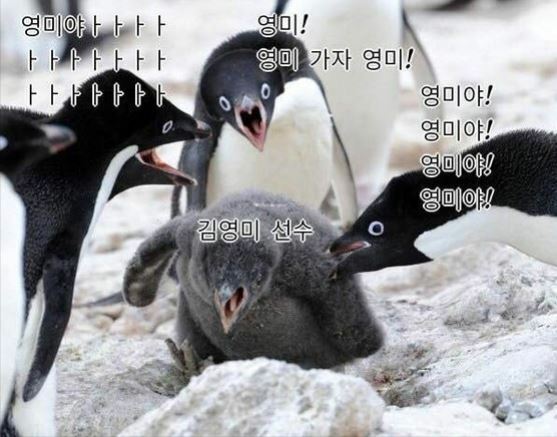 Unsurprisingly memes and parodies of Kim shouting “Yeong-mi-yah” have become another major hit among South Korea’s Olympic fans. Depending on the volume and speed of Kim’s voice and words, the strength and speed of her sweeping changes. In curling, teams often use a certain word to carry out their strategy during the game. Fans have been keen to pick up this particular catchphrase. Some have even drawn parody cartoons in which Kim’s ears are bleeding, apparently from having heard her name being called out too many times. 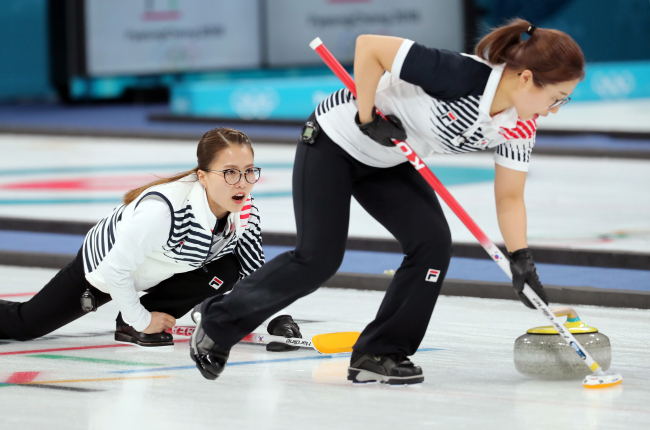 With their soaring popularity, the South Korean women’s curling team is garnering attention for their unique background in addition to their signature competition habits that has amused the public. 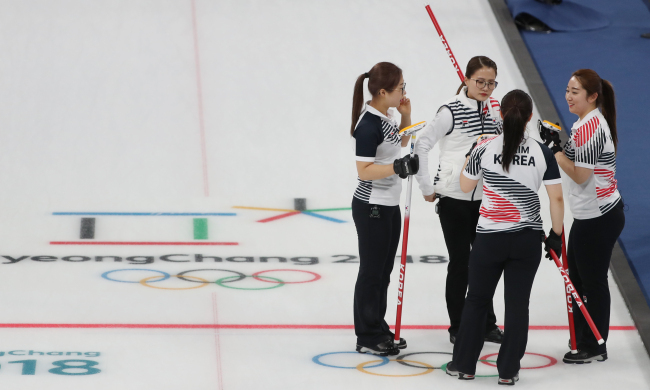 The women’s curling team is led by 27-year-old Kim Eun-jung, the team’s skip, and three other Kims -- Kim Kyeong-ae (third), Kim Seon-yeong (second), Kim Yeong-mi (lead). The team also has a fifth player in the alternate position, Kim Cho-hi. The four competing members all attended the same girls’ high school in Uiseong, North Gyeongsang Province, a small town with a population of just over 53,000 that is famous for its garlic. The competing team also revolves around the all-too-famous Kim Yeong-mi as the core. Kim Eun-jung and Kim Yeong-mi, who are high school friends, picked up curling as an after-school activity for fun, after South Korea opened its first-ever curling stadium in Uiseong back in 2006. Kim Yeong-mi’s sister, Kim Kyeong-ae, decided to pick up curling, after she dropped by the stadium to drop off some items for her sister. Later Kyeong-ae’s classmate, Kim Seon-yeong, also decided to join the team. Though they are all surnamed Kim, the most common last name in Korea, only two are related -- sisters Kim Yeong-mi and Kim Kyeong-ae. The team has also earned the nickname “Team Kim,” as all the members have same family name. Even their coach, Kim Min-jung, has it. According to curling rules, a team’s name is decided by the last name of the skip. So even with different last names, the team would have been named “Team Kim.” This time, however, “Team Kim” has taken on a double meaning.